In His Image Family Medicine Residency Program is a community-based family medicine training program fully accredited by the Accreditation Council for Graduate Medical Education (ACGME). Our clinical practice is Family Medical Care and our primary teaching hospital is St. John Medical Center, a major tertiary referral center in Tulsa. We have a very active family medicine inpatient service to which we admit patients from our clinic and the emergency room. This service is run by our residents under the supervision of our attending physicians. Care includes obstetrics, antepartum and postpartum patients, newborns and children ranging in age from infants to teenagers; and we treat many different adult medical problems and have a significant number of geriatric patients. We also provide medical consultations for surgical patients, both on a preoperative and postoperative basis. Our model family medicine clinic is excellent. All of our residents, Postgraduate Years (PGY) 1, 2 and 3, are in clinic on a regular basis and care for many patients. The patient payor mix is a variety of private pay, self pay, Medicaid and Medicare patients. Our clinic is fully staffed with excellent personnel, including lab technicians, x-ray technicians and qualified nurses. We have x-ray and laboratory capabilities and provide ultrasound, exercise stress testing and minor surgery for our patients. All residents must complete an extensive list of educational requirements prior to graduation. For those residents interested in additional preparation and training in specific areas, we offer areas of special emphasis. These are focused tracks that provide additional opportunities for learning in different areas. Each track has specific curricular items, a longitudinal experience plan and a faculty coordinator. Residents receive special recognition at graduation including a Certificate for each Track successfully completed. Good Samaritan Health Services (GSHS) is our partner in reaching out to individuals and families in need in the inner-city and the greater Tulsa area. During residency, In His Image Family Medicine residents help provide free high quality medical care and at the same time share hope and God’s love with these underserved patients. 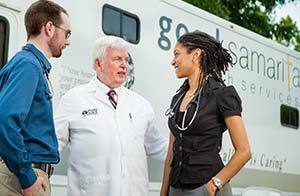 GSHS uses two Mobile Medical Units (a 35-foot unit, as well as a 60-foot Mobile Medical Unit equipped with three exam rooms, a pharmacy and a lab) to reach those who cannot afford medical attention or who experience difficulty accessing healthcare. 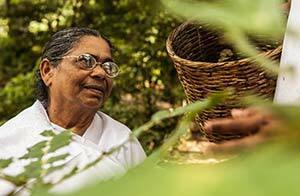 IHI residents work alongside other compassionate health professionals and over 200 caring volunteers from partner churches who desire to see the people in our local communities healed in all areas of life: physically, emotionally, mentally and spiritually. Learn more about Good Samaritan Health Services at GoodSamaritanHealth.org. God’s love knows no boundaries and neither do the classrooms of In His Image. Residents are encouraged to have a global health perspective and take advantage of international health rotations during residency. A resident may spend up to four months total completing graduation requirements internationally. Trip coordination and funding assistance for these rotations is available through In His Image International (IHII). IHII is an organization that takes medical care and the love of God to the far reaches of our hurting world. IHII short-term overseas outreaches include free clinics, disaster and crisis response, orphanage ministry, evangelistic retreats and a special emphasis on medical education through medical conferences and consultations in the development of family medicine residencies and primary care health systems. In addition, IHII is available to act as a sending agency for In His Image graduates who choose to serve full time internationally. Learn more about In His Image International at inhisimageinternational.org. How do you incorporate faith/ministry into the practice of medicine? In what ways does IHI support residents? During your three years in residency, you will have several elective months to select your own rotations. These may include local or out-of-town urban, inner city or rural rotations or international health clinical experiences. You will also have the opportunity to switch rotations with your classmates as needed. Call during your first year will average every fourth night but not on Sundays (on our inpatient service). Call for second and third year residents averages twice a month plus one evening per month on Good Samaritan Health Services mobile medical clinic. We believe in balance. Though you’ll work hard, our on-call schedule is designed to allow time for family, spiritual growth, exercise and recreation. Also, our attendings are available 24/7 during hospital call. We offer many opportunities for family fellowship involving spouses and children, as well as activities for our numerous single residents. You can look forward to weekly Bible studies (spouses welcome and childcare provided) and frequent get-togethers including holiday celebrations and Winter and Summer retreats. In short, we believe that if we expect you to be sensitive to the needs of your patients, we must help meet the emotional and spiritual needs of you and your family. What option do many residents choose for maternity or paternity leave? Residents may use their five sick days for any combination of personal illness and/or maternity or paternity leave. In addition and upon request, residents may stop residency for one month or work half-time for two months doing clinic and call with no rotational activities. With either option the resident would continue at full salary and benefits but later extend completion of residency by one month. Then during that last month of extended residency (typically July) the resident will work/study in rotational activities full-time with no clinic, no call, no salary. The program will continue to pay healthcare and malpractice insurance premiums for this extra month.